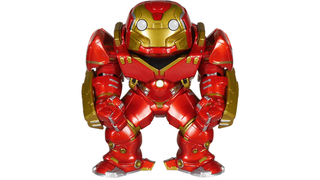 The Hulkbuster was sadly missing from the original line up of Age of Ultron Pop! Vinyls from last week, but never fear - here it is in all it's resplendent, enormous glory. How can a giant mech suit designed to beat the living crap out of a giant green rage monster look so adorable? The Hulkbuster will join the rest of Funko's Age of Ultron line up as a plus-sized 6" figure, and although there's no official release date quite yet, presumably it'll be out around the same time of the rest of them. Alas, you can't take the normal Iron Man Funko Pop and jam him inside the Hulkbuster one (á la the Lego version), but still, the figure looks appropriately awesome and hulkbustery... even though those eyes are more 'd'aaaaw' rather than 'I'm going to crush you with my giant fists'. I think the one thing I'm really looking forward to the most about Age of Ultron's merchandising deluge is seeing a plethora of Hulkbusters. Wonderful giant mech toys are always a good thing in my books! Plus, the big Funko Deathwing I have on my desk will need someone to fight with.